and music production keyboard, the MPK49 comes pre-stocked with Ableton Live Lite Akai Introducing the superpower music production tool from Akai, the MPK49. With all of the latest heavyweight features combined in a USB/MIDI controller keyboard for music production, the MPK49 is fired up and ready to go. Its sleek design, durable 49-key semi-weighted keyboard, 12-pad control surface, wide blue screen, sliders, knobs and pitch bend/mod wheels all add to its appeal. As a combination controller Edition software compatible with Mac or PC and is worth having in any studio environment. On power up, the MPK49 displays a fluorescent blue backlit screen with a wide viewable area, which is bigger in size compared to the smaller MPC500 drum machine. The workstation is compact with the drum pads, keyboard, wheels, sliders, knobs and buttons all positioned within easy reach. The full-size keys have a semiweighted action that is smooth and easy flowing. The MPK49's 12 pads can be used to trigger as many as 48 sounds from within the assignable four banks (A-B-C-D), sustaining the same velocity and sensitivity action as the MPC500 sampler. In Full Level mode, the drum pads play back with maximum velocity (127) regardless of the amount of pressure that you apply. I have extensive experience working with MPC drum machines, so using the familiar Full Level function on the MPK49 was a nice choice, letting me use the full dynamics of my drum programming. To work with the different velocities of the pads, there is a 12-Level function that allows you to actually adjust a sound's velocity in 12 different steps. That is a handy feature when using a software program because you can embellish and build character to your sounds. One of the best parts of programming drums on the MPC is the infamous Note Repeat, which rolls a sound in repetition while the producer holds it down — a feature Akai also added to the MPK49. The standard pitch bend and modulation wheels are on the left side of the keyboard. To the right of those, in the Performance Controls section, lies the built-in Arpeggiator, which was a real treat for giving me extra dynamic handling when I used my favorite Propellerhead Reason software patches. Things get even better with the Latch button activated. When using the Arpeggiator and Latch button in combination, the unit will sustain any keys that you strike, so you can tweak the sound while creating your music. After you play around with the Arpeggiator, you can quantize your notes and mess with your timing with the Time Division feature. The different timing options available there are ¼, ¼T (triplet), ⅛, ⅛T, 1/16, 1/16T, 1/32 and 1/32T. When I used this feature, the timing changes were accurate, and they can be applied equally well to instrument notes and drum programming. The main control section on the right-hand side of the MPK49 consists of eight knobs, eight sliders and eight buttons, which are all assignable to four Banks (A, B, C and D) for a total of 32 assigned knob commands, 32 assigned slider commands and 32 assigned button functions. In all, that's nearly 100 assignable MIDI controls, which represents a ton of potential. When programming drums, the assignable buttons specifically set the Time Division values of the Arpeggiator and Note Repeat. Below the LCD, the five transport buttons help take control of a software sequencer's playback. 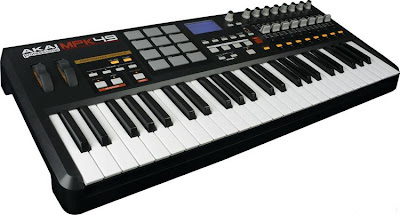 The MPK49 comes with four main operation modes: Preset, Edit, Global and Program Change. In Preset mode, you can load, save and copy as many as 30 presets in the internal memory, as well as save all of your custom configurations, so you can quickly load the templates you need to use while producing without having to reprogram the unit each time. In Edit mode, you can edit the configuration of the MPK49 by making functional changes to the keyboard, pads, knobs and sliders. For example, you may want to have a slider or a knob transmit only specific MIDI data, or you may want to have a pad that transmits play, record, stop or any number of other MIDI channel functions. This Edit mode has no limitations; it's a powerful tool for customizing your setup. In Global mode, you can set parameters that will change how the entire MPK49 functions. For example, you can change how the pads respond to aftertouch or change the brightness of the LCD. Other adjustable parameters include controller resets and pad response curves. In Program Change mode, you can transmit various Program Change messages that will tell your DAW or another external device to switch to a different program bank of sounds. By using this function, I avoided having to manually switch between different programs on my DAW and external device, such as an MPC2500. In addition to editing manually from the MPK49, the unit ships with Vyzex software, a stand-alone editing program used for editing all of the above-mentioned settings from a computer. I use keyboard controllers for various purposes, one of which is to play instrument patches from my external sound modules, so I thought it would be really cool to control my MPC2500 solely with the MPK49. The first thing I wanted to do is have the MPK49 control all of my transport functions on the MPC. I chose a generic preset on the MPK49 to start the process, but I had to make some adjustments to the MPC in order for it to work. First, I opened up the MIDI/SYNC page on the MPC and set the Receive MMC to On. Secondly, on the MPK49, I selected Program Change, and then scrolled to the Send MIDI page. There you can play with all of your different MIDI settings, such as MIDI channel, program numbers, bank options and more. The MPK49 can be powered up using an optional power adapter or via USB bus power. When the MPK49 is powered through the USB cable, it disconnects the communication between the independent MIDI Out port of the unit, so if you are trying to trigger sounds from another MPC drum machine or another MIDI sound module, you will have to purchase the optional AC adapter. The MIDI In and MIDI Out connections can send and receive MIDI data to and from your computer, or they can also be set up to send MIDI data from your computer to a device attached to the MPK49's MIDI Out port. There are also Sustain Pedal and Expression Pedal connectors for additional control via optional footswitches. I always have high expectations for my gear, especially when it comes to keyboard controllers and drum machines/samplers. Anyone who has built their foundation using the Akai MPC series will appreciate the signature drum pads, keys and sliders that make this a superior controller. I am definitely sold on the Note Repeat feature, which no other keyboard controller has. Using the arpeggiator along with Reason and Apple Logic Pro 8 inspired me with the creative drive to go deeper into my ideas. One small beef I had was that although the MPK49 has a nice wide screen, it doesn't always auto detect software devices that are active. For example, as I scrolled through Reason's different devices, the controller did not display all of them on its screen. Still, the MPK49 is a really hot piece of gear to own if you plan on doing hip-hop or another type of sample- and beat-driven music. Anyone using MIDI sound modules or samplers will get hooked on this controller as well. The learning curve is a bit difficult at first, but once you set up custom configurations, it's smooth sailing from there. As a combined keyboard controller and drum pad controller, I have to say that the MPK49 is the best feeling controller keyboard yet. Pros: Compact workstation design. Important features brought over from Akai's MPC series, such as Note Repeat and MPC Swing. Arpeggiator and Time Division features. Aftertouch on the pads and keyboard. Bright LCD screen. Great feel and fun to use. Cons: Automapping for older software isn't available. Single button to toggle from the different banks. Controller drum pads lack fatness of MPC drum machine pads. Power adapter sold separately. No On/Off power switch.